I used to love making lasagna back when I ate carbs. Its so easy to layer it up and it makes a super hearty meal. I’ve tried making it with eggplant before but it just wasn’t the same. 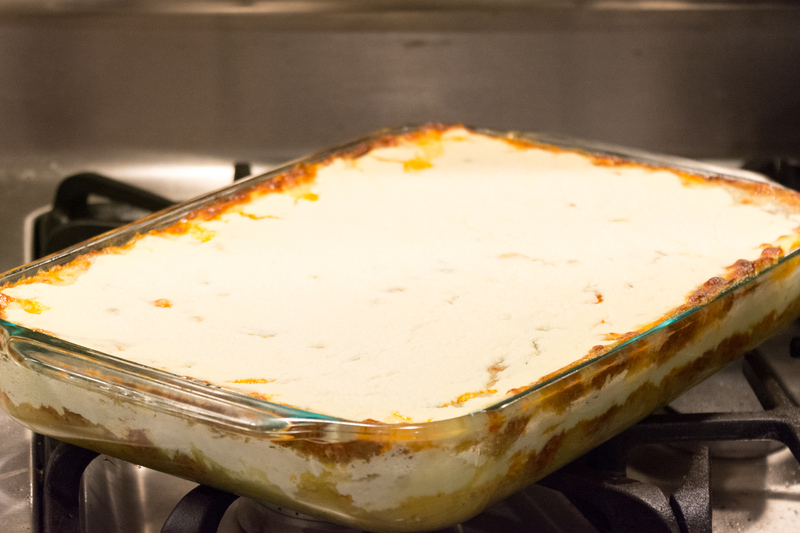 However, I was in the grocery store the other day and got the bright idea to make lasagna out of Spaghetti Squash! 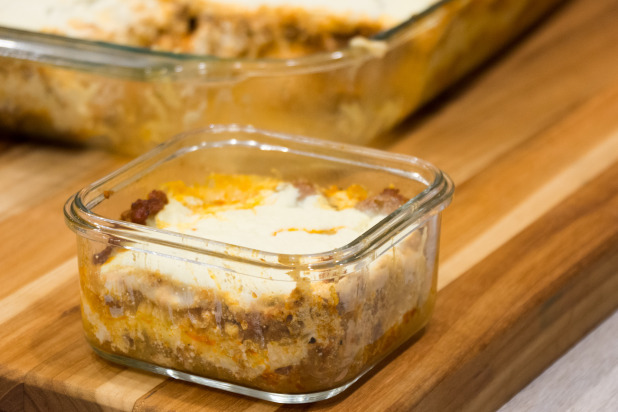 I’m always looking for new lunch ideas so I thought I’d make this one into a 5-day recipe, meaning it will make lunch for the entire week for my wife and I. It turned out amazing and I think this might be one of my favorite meals!! 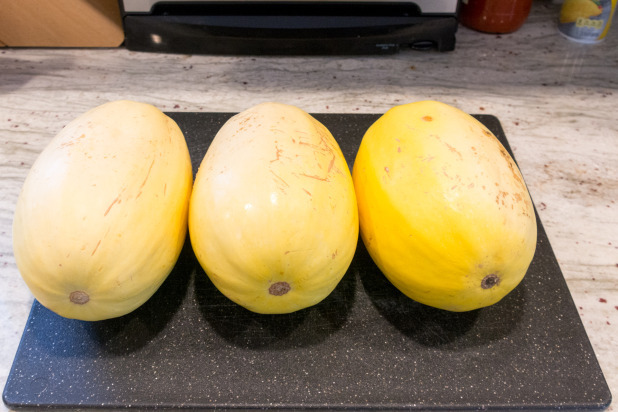 I’m showing three Spaghetti Squash but after cooking it all up, I think you’d only need two. 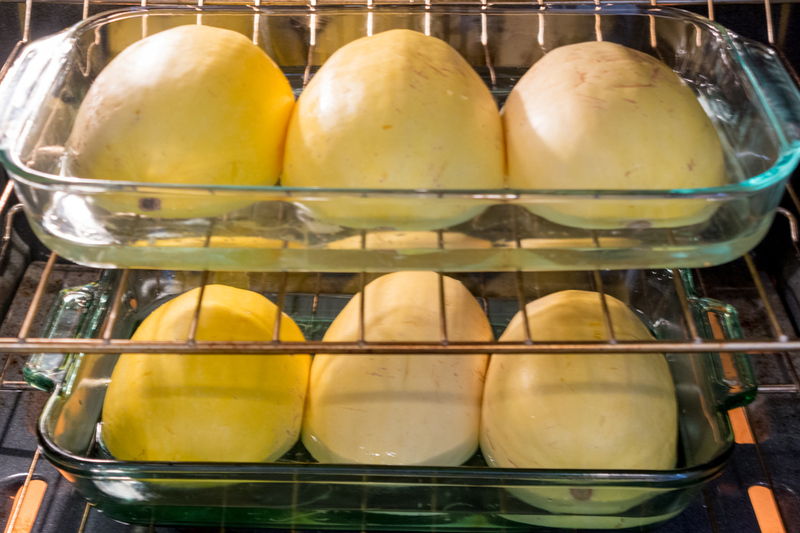 In case you’re wondering, the above is 4.241 kg of raw Spaghetti Squash which yielded 2.303 kg of cooked Spaghetti Squash. 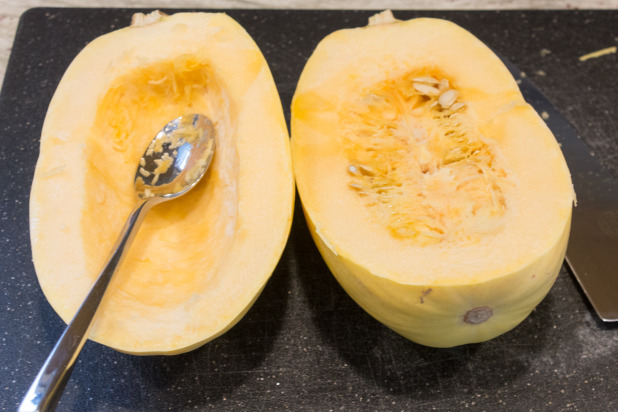 In general you get about half the weight of the Squash in terms of a yield. I ended up using 1.224 kg of Spaghetti Squash for the this recipe which is 2.25kg of raw Spaghetti Squash if you want to just buy that at the store. 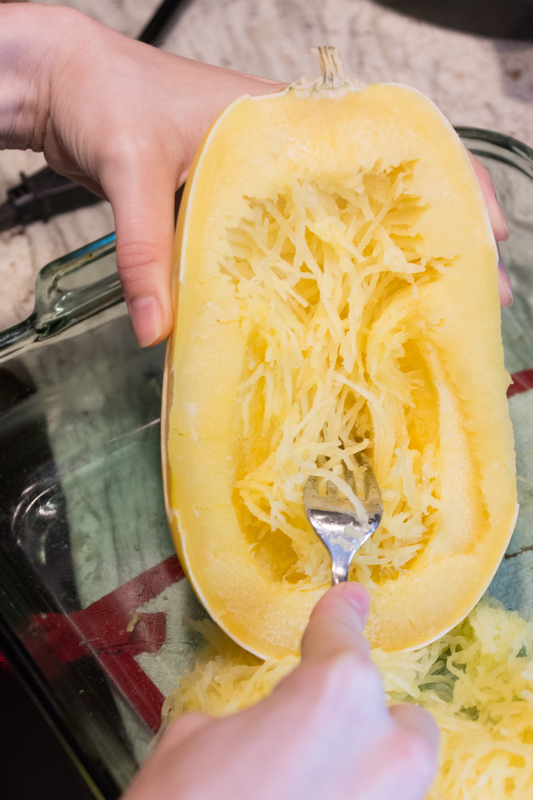 Start by carefully cutting the Spaghetti Squash in half and reaming the insides out much like a pumpkin. 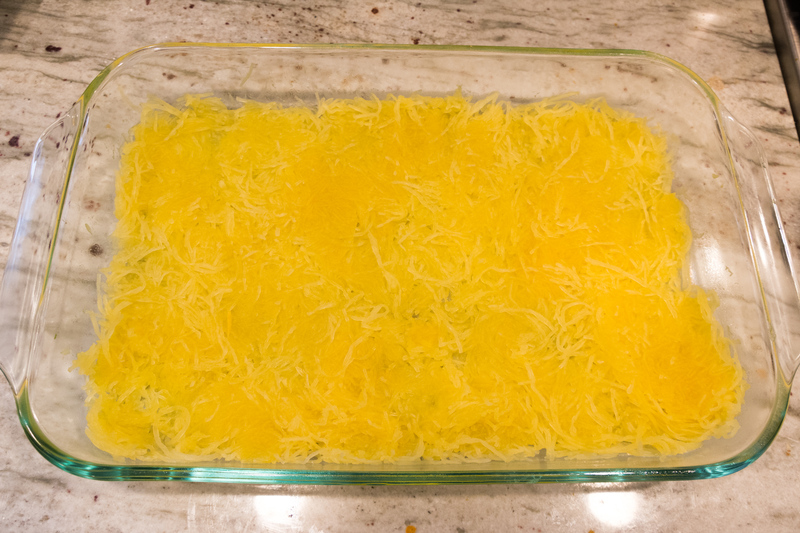 Then place the Spaghetti Squash cut side down in a baking dish with water covering the meat part. Cook for 45 minutes at 375 degrees. If you have a different, favorite way to prepare Spaghetti Squash, go for it! It doesn’t matter as long as you’ve got the correct amount in the end. This stuff is magic. Its called Spaghetti Squash because, as you can see, when you scrap at it with a fork it breaks apart and looks almost exactly like Spaghetti! 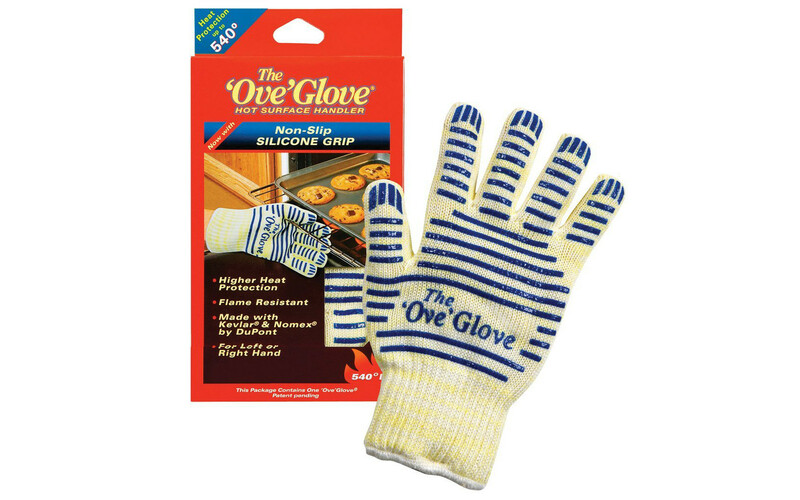 Note: these things are really hot out of the oven, I normally use an Ove Glove to hold it but my wife has hands of steel 🙂 While the Spaghetti Squash is in the oven, we can work on the sauce. 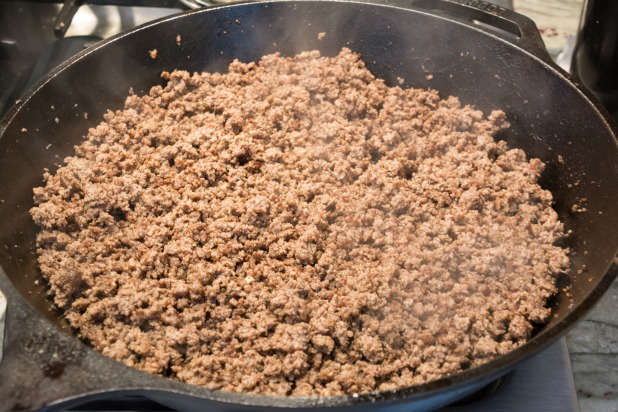 For this recipe, I used 3 Lbs of 75% ground beef. 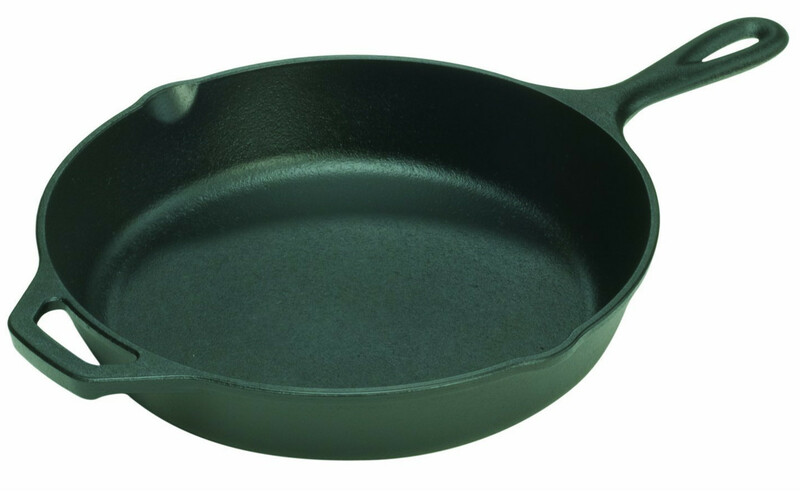 I have a huge 15″ skillet that I use or you can break it into two batches. Next time I wouldn’t go with 75% beef though, it just cooked out and it didn’t add much compared to the 85%. 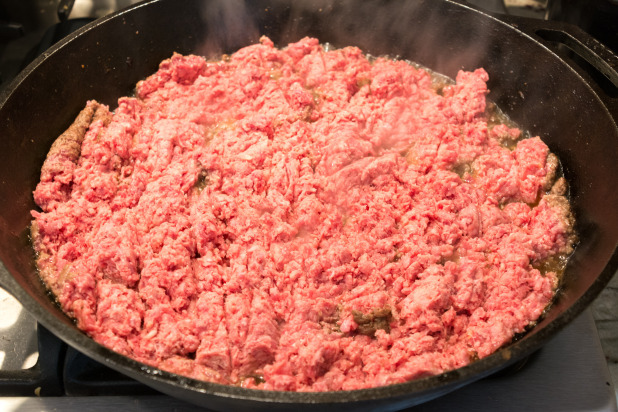 Here’s the browned beef. 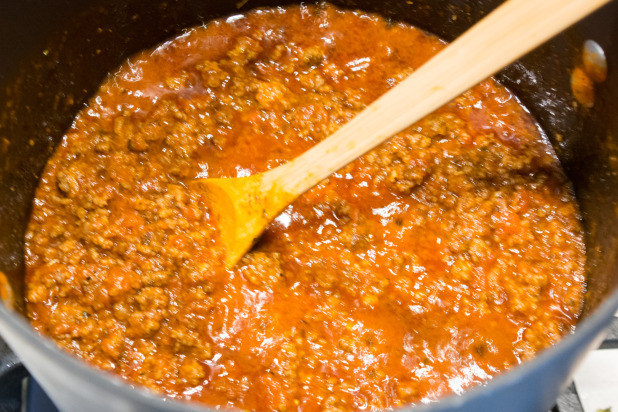 Transfer the beef to a pot and add the Marinara Sauce. You’re just combining them here so you can cook it for about 5 minutes and then shut it off until you are ready for assembly. 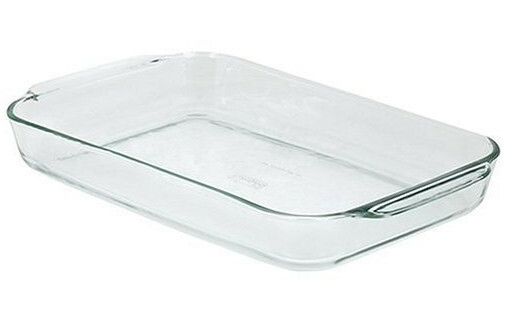 Now, take a large baking dish and start the assembly process. The first layer is going to be the noodles. My thoughts were that you want the liquid to seep down so I started with the noodles. 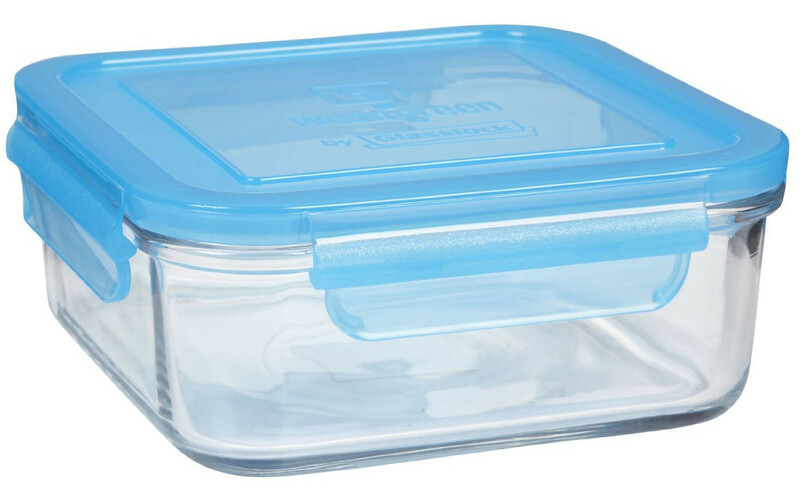 Make it as thin as possible so you can fit more layers. Next, carefully add a layer of the meat sauce. 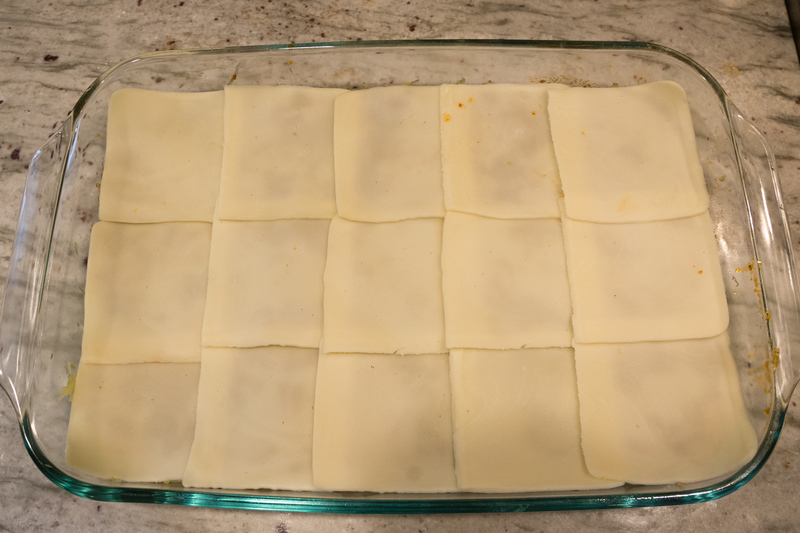 Then add 15 slices of cheese. Then spread the Ricotta over the cheese. After this, repeat for another layer! I was only able to fit two full layers but it went right to the top. Here’s a pic of the finished casserole and as you can see, it has a nice golden brown crust on the cheese and the ingredients have melded together. Here’s a shot of the finished product packaged up and ready for lunch! 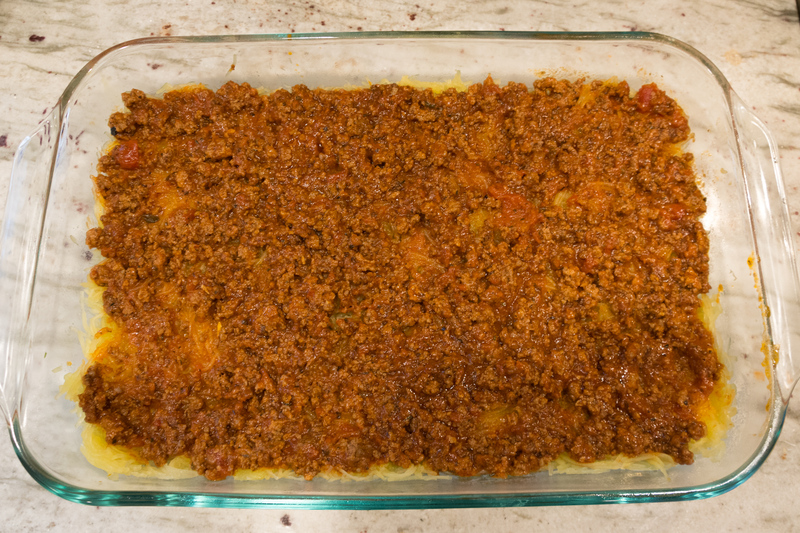 I recommend letting the casserole cool down a bit before breaking up and storing so that it comes out whole. One of the lowest carb pasta sauces. 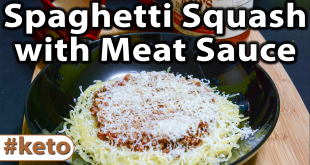 Works well with any of the faux pasta sauces or for use in a keto pizza! This lasagna looks great. 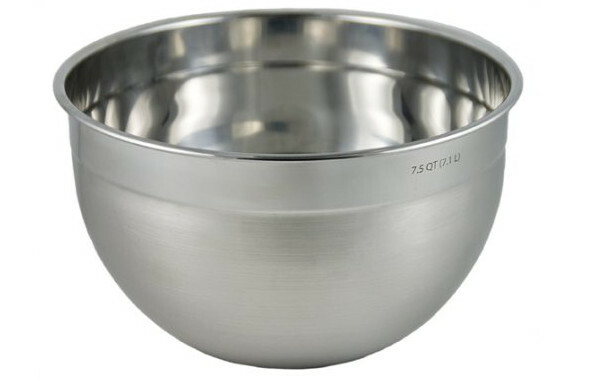 I’ve been using your recipes for several weeks now and am starting to shed the pounds. Thanks for all your hard work in putting your site together. My wife and I have been following your recipes exclusively but using MFP we often get higher carb counts. How do you manage to stay under 20 net carbs daily with a 13 carb lunch? This recipe ended up being a little more carby than I wanted so one might need to eat a less carby dinner and breakfast to stay under 20g. I made this this weekend, turned out awesome! 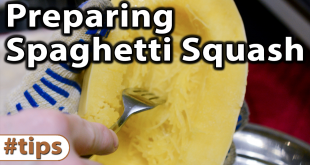 Are most of the carbs coming from the sauce or the squash? 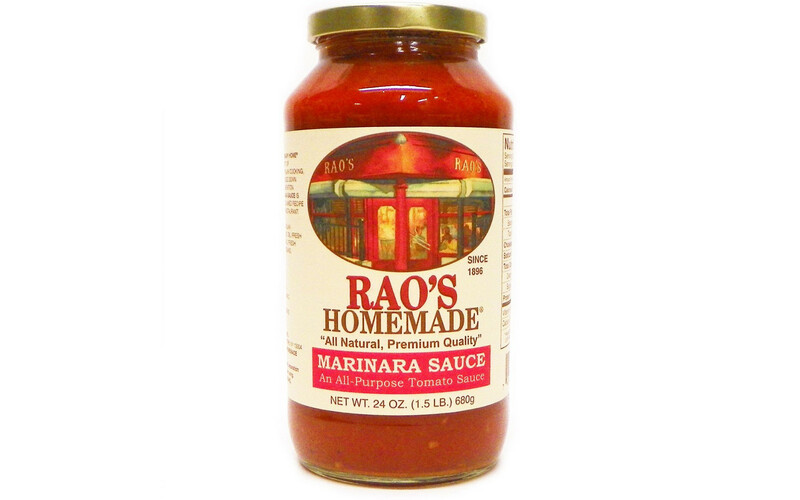 I usually stay away from marinara since even the best ones put quite a bit of sugar in them as thats what makes it marinara. heres a tip. dont throw out the seeds! wash off all the fibers and roast them in the oven for a great snack. you could sprinkle with salt but i just put them in as is. they also take a while to eat since i dont eat the shell. I’m obsessed with this recipe. I’ve made it twice this week with the most recent time being tonight. I made a slight change in the recipe that’s not necessary, but that I think makes the squash a little more pasta-y. Basically I just put all the spaghetti squash (2 lbs in this case) in a food processor with 3 eggs to get a pastier consistency. 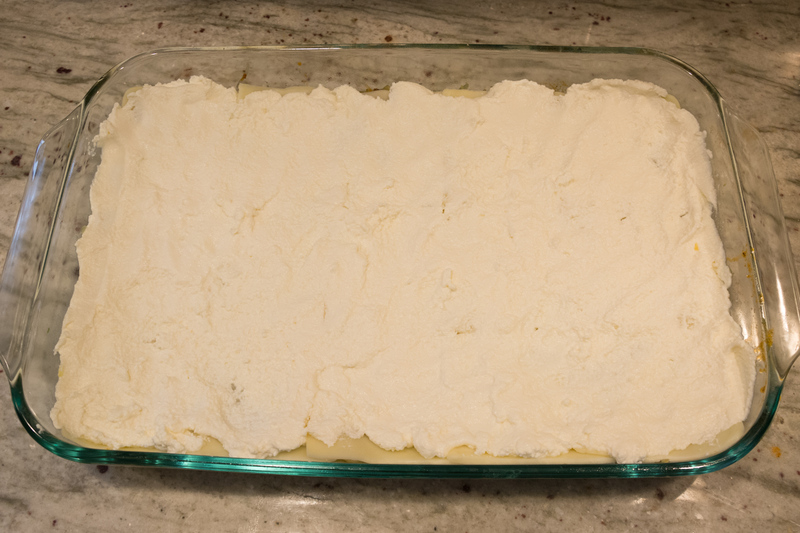 Then I spread the mixture thinly on baking sheets with wax paper and cook it for ~10 minutes at 350. It didn’t turn out perfect put I really liked it. I’ll probably experiment with it some more to find what works best. Just wanted to share.